Minecraft, the most popular Indie Game of these last years, records a success story with more than 4 Million Minecrafters all around the world. It delivers a Single Player Mode to acquire game skills, but the real fun lies on the Online Game Multiplayer. That's why, World Cloud Hosting provides best minecraft hosts. Be careful, the game becomes really more addictive! The vMinecraft Server is a virtual Private Server (VPS) performed for creating an online Minecraft Community. Powered with a Dedicated Computing Capacity (RAM, GT-Core), vMinecraft Server is able to host Unlimited Slots for a Community with an Unlimited Mincrafter's. All Minecraft VPS Hosting Services delivered by World Cloud Hosting are 100% Dedicated Resources. The New Range of CPU, GT-Core (Gaming Turbo Core), is designed to provide a computing capacity especially for Gaming Servers and optimized for the best Game Comfort without any Lag problems. The RAM resource is specially designed to avoid any issue of slow or overloaded server. You can also use the Disk Space to Backup your different Hosted Worlds. 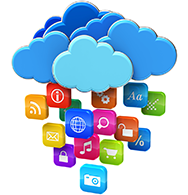 World Cloud Hosting guarantees a 100 Mbps Bandwidth with an Unlimited Traffic. So you can enjoy with your vMinecraft Server at every moment without any connection restrictions. World Cloud Hosting provides best minecraft server hosts with Autorun Scripts to connect to your Minecraft Server Hosting with seizing directly your IP Address in your Minecraft Game. 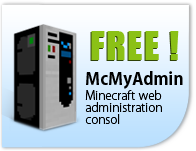 You can control, administrate and manage your hosted minecraft server and all the Minecrafters connected via SSH or using the User-friendly Web Hosting Control Panel, Webmin. 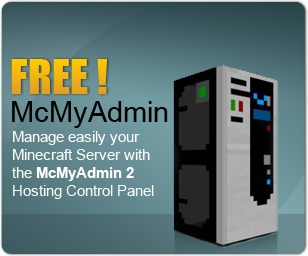 This Powerful and Smart Control Panel allows you to manage and administrate your Linux Server and monitor the resources of your Hosted minecraft server hosting. All vMinecraft Server are delivered with the latest version of Minecraft Server and Java Openjdk tool, to be able to connect to your Hosted Server without doing any update operation and start Crafting your new world immediately after acquiring your Hosted Minecraft Server. World Cloud Hosting deliver the Best Minecraft Server Hosting Service with the Best Value for Money. You'll never find a Cheapest Minecraft Hosting Solution. For all the before mentioned reasons, World Cloud Hostingstands as the largest choices’ provider of cheap bukkit server hosting, only to satisfy the user who is tired of being deluded by unreliable offers presented by untrustworthy providers. The best tekkit server host must satisfy all users whether singular or multiplayers; for that reasons we suggest to buy minecraft server to discover how much care afforded when inventing our new Server. Here is the Official Trailer of Minecraft, the best Sand Box Game ever made and delivering infinite Possibilities. You can build everything you want and travel everywhere. But be careful, at night, monsters will appear and the real survival challenge will begin! All these Adventures are more pleasurable in the Multiplayer mode provided with the Hosted Minecraft server of World Cloud Hosting. So you can build bigger constructions with your friends, you can create your own rules and your own Game experience. Every Minecraft server hosting is unique with a new Kind of Minecraft adventure, with new people and with new experiences. Every vMinecraft server is a new world with new Landscapes with different Biomes where you can operate your imagination to create the best Minecraft Server. The Minecraft server is specially elaborated to deliver the best online Minecraft experience without any lag problems. All the Hosted Minecraft VPS are 100% dedicated resources and are performed to provide unique community experience and the Unlimited Bandwidth/Traffic will allow you to play 24x7x365. Our technical staff is always available to solve your problems and to install all the add-on you need like CraftBukkit, Permission Plugins, etc. Order Now and own your Minecraft World. Taxes, wages, interest ... Become a crafter capitalist! Manage your entire server with many additional features. Allows the automation of cars and lots of other things! Adds key commands for your server. Can edit the map in real time directly on the server. Add shops to sell your gems!